The SPLC would have the world believe that the Catholic Church for nearly two thouand years was a self-serving racist organization... before the Second Vatican Council got rid of all the hate. So where are all the Southern Poverty Law Center’s hospitals? Where are their orphanages, homeless shelters, schools, universities? The SPLC likes to talk about how much they care about poor people but what have they actually done for poor people? The reality is this: No organization in the history of the world has done more for the poor and needy, ethnic minorities, the downtrodden and miserable collateral damage of man's inhumanity to man than that Catholic Church. It is also the most truly color blind organization the world has ever known. We here at The Remnant do not hesitate to offer our support and solidarity to the D. James Kennedy Ministries. As Catholics and Protestants, we have our serious theological differences, of course, but when it comes to principled opposition to the Southern Poverty Law Center we stand as one. Lost in the conciliar jibber-jabber of the past half century is the fact that there is, in fact, a legitimate form of ecumenism, and this is one such example. Throwing in with non-Catholics against that which presents a clear and present danger to the common good of all, is certainly worth a try, especially in a Christophobic world like ours. And there are plenty of precedents for this. Clinging to the ramparts of this new Tower of Babel (where precious few of us can communicate at all anymore), I’m heartened by the fact that Catholics and Protestants, despite serious theological differences, can nevertheless speak the same language when it comes to the Christophobes that hate us all. And this is nothing new. In the past, men and women from divergent cultural backgrounds and religious traditions for the most part managed to differentiate between serious differences of opinion on the one hand, and hatred and even a refusal to stand against an invading enemy on the other. People weren’t always the petulant kindergarteners we are today. Our critics will rush to try to refute this by citing those wars of religion and turf that were waged even back in the ages of Faith, and admittedly there were a few. But noble engagement between men-at-arms on a battlefield cannot be compared to what’s going on today. Even just in terms of casualties, the wars of yesterday didn’t hold a candle to the wars of today. The number of dead at Dresden alone exceeds that of all the “wars of religion” combined. And the senseless, random killing for killing's sake in our streets and classrooms is an anomaly quite unique to our enlightened, post-Christian society. For the most part, the “big people” back in the day understood that a heated debate over religion didn’t include hate or wishing ill on those raised in different traditions. There’s only one true religion, this is certain; but helping the whole world recognize which one is True is a challenge that has been ongoing for 2000 years. And it will likely go on for another 2000 years, if the world doesn’t end first. In the Christian world, the 'greatest of these is charity'. Love of God and Love of Neighbor combine to form the 'great commandment to God'. Not so in our post-Christian world today, where it's Lord of the Flies all over the place. It's all about hate and polarization, shouting and ugly threats, lies and false accusations—the very stuff in which the Southern Poverty Law Center traffics on a daily basis. They’re evidently projecting on Christian America their own attitude of intolerance of anyone with whom they disagree. They hate—and so they naturally assume everyone else hates, too. They aren't interested in the truth. They're not even interested in debate. For them, it's all about inflammatory rhetoric, fomenting discord, and throwing ideological gasoline on open flames. The followers of Jesus Christ are not that way. It is out of love that they share His message with the world--so that others may know the salvific sacrifice of Jesus Christ and find the peace of mind and soul that comes with the free decision to follow Him. We can cite the work of entire generations of missionaries to prove the point. No one can be forced to follow, and those who choose not to cannot be hated for lacking the grace to see the Light. Does the SPLC imagine that Father Isaac Jogues, for example, hated the Iroquois who gnawed off his fingers so that he couldn’t say Mass? Even after they’d almost killed him the first time, he returned to them out of love, knowing that they might well kill him—which is exactly what they did on October 18, 1646, in Auriesville, New York. Not only were the Iroquois not Christian, but they were unbaptized pagans—and still the Church loved them enough to sacrifice her best and brightest priests on their behalf. This is what Christianity is all about, and has been since the days when little Agnes and Lucy and Cecilia and Barbara went to the lions, singing praises to God and forgiving their enemies. It has something to do with “Father, forgive them for they know not what they do.” Remember that? Christ forgave his executioners, even from the Cross. The “hateful Christian” is thus a contradiction in terms. When the Christian begins to hate he ceases to be Christian. Jesus Christ forbade hatred under pain of mortal sin, which includes wishing harm on any fellow human being for any reason, whether that person be an apostate Christian, one who has done us great injustice, a Jew who does not recognize Christ as the Messiah, a homosexual who thinks he should be allowed to marry another man, even the deeply disturbed person who would abuse a child. For the Christian, hate never enters into it. And this is to say nothing of the historical laugher which has it that Catholics were always racist—something else the SPLC would have the world believe. I'm curious: Where are all the Southern Poverty Law Center’s hospitals? Where are their orphanages, homeless shelters, schools? 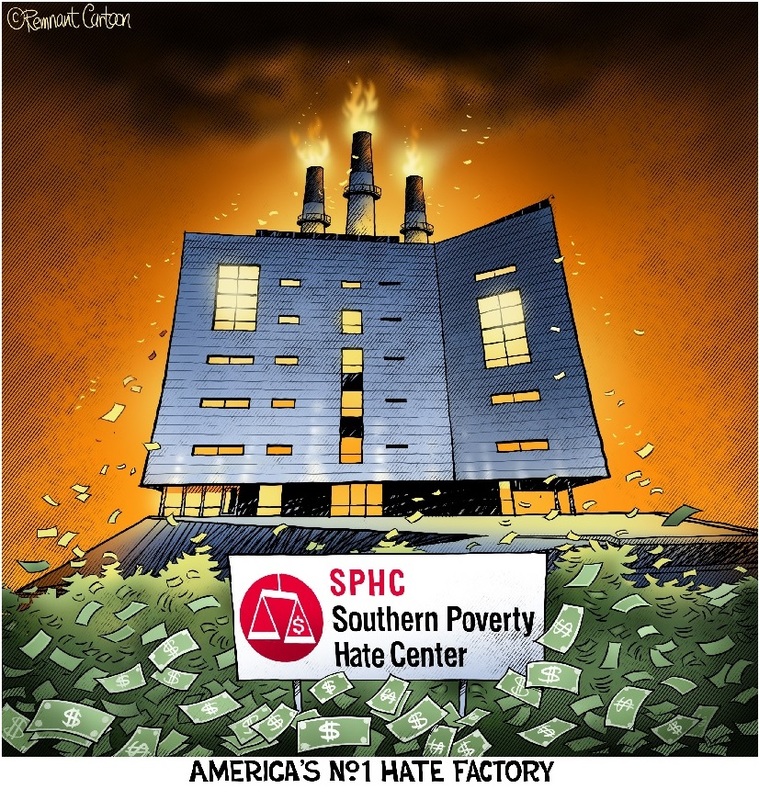 The SPLC likes to talk about how much they care about poor people but what have they done for the poor people? Catholic missionaries, on the other hand, transformed the world and dotted the continents with cities (such as St. Paul, MN), hospitals, schools, orphanages, homes for the homeless, soup kitchens. And yet the SPLC would have their benighted donors believe that the Church before Vatican II was racist, anti-Semitic, filled with hate, when for 2000 years she has been in the service of millions of underprivileged minorities and victims of horrific poverty and deprivation. No organization in the history of the world has done more for the poor and needy, ethnic minorities, the downtrodden and miserable collateral damage of man's inhumanity to man. In fact, the Church Christ founded is the only truly non-racist religion the world has ever known, with membership open to all peoples, cultures, skin colors, sexes, nationalities. Catholics are proud of their canonized role models who are black (St. Augustine, Father and Doctor of the Church), brown (St. Martin de Porres), white (St. Thomas Aquinas), yellow (St. Augustine Zhao Rong and his 119 companions), red (St. Kateri Tekakwitha), Jew (the first Bishops of the Catholic Church, the Blessed Virgin Mary), Gentile, and every stripe that makes up the human family. And NEWSFLASH to the SPLC: The Catholic Church is not homophobic. Catholics were always taught by those much-despised (by the Left) Catholic nuns, that being homosexual or having those inclinations is not sinful, and that the chaste homosexual is as welcome at the Communion rail as the repentant adulterer. Conversely, the non-repentant, heterosexual adulterer is forbidden to frequent the sacraments under the same terms and conditions that apply to the non-repentant practicing homosexual. The Church doesn’t hate adulterers. She doesn’t hate homosexuals. "Let he who has not sinned cast the first stone", said Jesus to those who were about to stone an adulteress. The Church loves all of God’s children, and calls us all to a life of virtue. If we at The Remnant succeed in launching our own lawsuit against the SPLC, I have every intention of calling on the expert testimony of traditional Catholic priests to explain the moral theology which forms the bedrock of the Christian life. In ten minutes, a good priest would win over judge and jury, and help every open-minded non-Catholic in the courtroom see the SPLC’s defamation for the slander that it is. How would The Remnant get away with hating those with whom its editors disagree when hate automatically disqualifies us not only from seeing God face-to-face, but also from being taken seriously as a Christian newspaper? It's Brigitte Bardot in a chinchilla coat. If you are a hate group, you simply cannot be part of a religion founded by a Man who taught the absolute necessity of loving your enemies, even 'turning the other cheek'. A Catholic who hates the sinner is more offensive in the eyes of God than the sinner himself. It’s insanity! And, clearly, these hate-mongers either have no grasp of the theological absurdity of their claims, or they’re engaging in willful slander. Either way, they have no case against us and they know it. But this only makes the situation for Christians that much more precarious. The SPLC doesn't need to make its case—not anymore. Why? Because they operate in a new society that has rejected the Christian moral code. The SPLC can say or do whatever they can legally get away with—morality having no bearing on it--because they're utterly unconcerned about the things of the soul, if they believe in it at all. They have no sense of justice, because they operate in a world where evil prevails on the strength of its own raw power, where God and His law can be summarily dismissed, and where the tried and tested fear tactics of the Gestapo and the KGB override truth and the obligation to do what’s right for the common good of society. As such, the SPLC represents a Christophobic future where Christians will no longer be considered deserving of due process, a fair trial, even a hearing—and where the mob will scream for the lions, the rack, and the cross—whatever it takes to silence the Christian voice. Prepare for martyrdom? Seems like a clever idea to me. If it doesn't come to that, praise God! If it does, we’ll be ready. In the meantime, we must fight like hell against Hell itself, always with the understanding that this fight is not about the Christian groups (including The Remnant) that currently occupy places of honor on the Southern Poverty Law Center’s ‘hate map’. We’re merely the frontline, the first to be rounded up. Once they overpower us (and with their $300 million war chest that may not be very difficult) they'll come for you, your priest, your senator, your favorite conservative radio personality—anyone daring to espouse opinions which run contrary to their Christophobic worldview. It’s the systematic criminalization of everything in which we believe and which we promised at Confirmation to die rather than deny. Christians in the future will be considered guilty until proven innocent. There will be no due process. No trial. No hearing. And the only way to prove our innocence will be to apostatize, which is what this is all about, by the way-- forcing people to save their skins by telling Christ to go to Hell. So, what are you going to do when they come for you? Please help the Remnant defend against the SPLC.